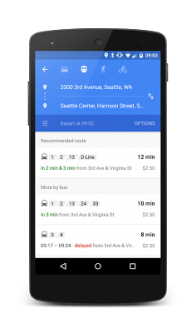 Google Maps keeps getting better for Seattle-area transit users. After last week’s integration of Community Transit route data, we now have real-time information for the major Seattle-area agencies, including King County Metro, Sound Transit, Pierce Transit, and Intercity Transit. Real-time means that Google not only knows the bus schedule but knows if it’s running on time or not. Combine that feature with Google’s already excellent trip planning, and you have a one-stop shop for determining what bus to take. “We are getting better and better about being able to tell you the fastest way between two locations given the state of the world,” Ferris said. The upgraded Google Maps is coming to Android first and will appear soon on iOS. I don’t know if Google is doing flighting or something, because I have iOS and I first noticed this in my Google maps app on Sunday. Love the feature – it’s cool that I can click on a single trip and see the history of the route and its comparison to the schedule very easily (OBA only shows you the history of the actual times, not a comparison between actual and scheduled). I too am already seeing this on iOS for select routes. I can’t answer exactly because I don’t have a smartphone, but here’s how it’s laid out on the Google Maps website. Which doesn’t make sense because that would be 3 minutes late, not 6. But when I got to see more details on this trip, Google Maps then tells me that the original bus time was 8:52, it’s been delayed to 8:58, so I should now leave my house at 8:55 to walk over to the bus stop. So my trip is 6 minutes later than originally scheduled, but Google Maps is not displaying the original time I should have left my house. Long story short, it appears the time of the trip (8:55) is the exact time you should be leaving. All of this is downright confusing. There could be a better way of presenting the data, but I like what Google is doing. The railroads in Germany do this. “7:22 (9 min später)”. It’s OK for short delays but when it gets to 40 minutes it’s hard to add it up in your head and figure out when the actual departure is supposed to be. This was in 1998 when many stations had flip signs. Maybe they have electronic displays now. That’s all well and good, but Google’s UI and trip planner is worse than OBA, which also in pretty awful. The only nice thing about it is that it’s faster. Sorry, sticking with Transit App, which knows how to actually provide useful information to multimodal users. I tend to agree. This is useful but OBA & Transit App show realtime better. The game changer will be whoever comes up with realtime trip planning first, where it tells you which route is going to get you to your destination first based on current realtime data. What are you seeing in Transit App that indicates the trip planner search is based on realtime data? Just did a trip planner search in San Fran and it looks to be exclusively based on the schedule. Try a routing like John and Broadway in Seattle. Start with the normal mode to see the routes and real-time arrival for the local buses next to the main stops there. Then begin trip planning and choose a routing to Downtown Seattle like 3rd and Pine. You’ll see that it includes the walk-time plus real-time options. Maybe the San Fran data is broken. It worked for me this morning. I tried last week on transit app and it based the trip off of schedules not real time. There are technical problems with Metro spewing bad data. Bad data in bad data out. Worse, Metro is often dropping real-time info at the moment on all platforms. I don’t know why all their GTFS is so screwed up. Not Transit App’s fault. It is working when the data is working. I think you’re misunderstand. It is giving me directions based on the scheduled arrival times rather than adjusting the instructions because the last bus is 10 minutes late. The nearby stops view is showing realtime so I know that’s working at the moment. Next up, let’s get Everett Transit on Google Maps. The feed is published the same way as the Community Transit feed & already on both OBA & Transit App. Adding agencies is cool and all, but it would be even nicer if they could apply some leverage and pry the real-time location data out of CT’s hands. After all, it’s only YEARS since their AVL system went online, and almost a year that the data has been semi-available, but trapped inside CT’s horrible busfinder web site. This is really inexcusable. It’s not real time in Pierce County. I checked the #13 on Google, then watched it drive past 10 minutes later than it said. Moreover, the stop outside my window is a timepoint on the route schedule, so this should be even more accurate in the estimate. This route only comes every hour, as do most routes in Pierce County, making transfers VERY difficult when the routes run late. Having real time data would be extremely helpful here, but it does not appear that Google is providing this. It’s only as good as the data they get. Their routes are real time on Google maps. Okay, so regardless of whatever they are advertising or however many caveats we want to put on it, it is NOT real-time. Okay, maybe the data they are getting is bad. It doesn’t make it any more real time for the end user. It would be really great to see an option for combining the bike and the bus in trip planning. I commute from the Delridge area to South Lake Union. The 120 bus provides a much faster connection between Delridge and downtown than I could manage on my bike, but it’s much faster to get off the bus downtown and bike the rest of the way instead of waiting for another bus. But with google maps, it’s either all bus (and walking) OR all bike – no combination of the two. When planning trips to parts of town I’m unfamiliar with, I often find myself wondering if I’d be better off skipping a transfer and using my bike for a portion of the trip instead. One problem I can see with trip time prediction incorporating cycling is that the speed of cyclists is so variable depending on type of bike and ability. I’m in my late 50’s, and have some trouble reaching 15 miles per hour on my hybrid bike (except downhill with a favorable tailwind) and nearly get bowled over by the wind off the Spandex terrorists on their road bikes topping 30. I don’t think walking speeds are nearly as variable. True, but Google already does trip time estimates for bikes, and they seem to be quite conservative in their speed estimate. I’m no racer, but my trip times are about 25% quicker than their estimates. I know that and take it into account when planning trips by bike. Since they already have bike estimates, all they need to do is combine modalities in their trip estimates, not include new ones. So the bus/bike combo is the fastest, even without accounting for Google’s conservative bike speed estimate. But I wouldn’t know that without tediously mapping both segments individually. It’s also not clear where the best place to get off the bus and onto a bike is. In this case, a slightly longer bike ride by distance nets a shorter overall trip duration. I still get second opinions from the local trip planner, unless it is Google anyway. I’ve run into too many problems with Google telling me to walk through buildings or otherwise do things that are physically impossible. I report the results, but that doesn’t make the error any less problematic when planning a trip. Sometimes, the local trip planner has an idea that works better, and sometimes Google comes up with the best solution. This shows why I get a second opinion if that option exists. Try using the local trip planner by King County Metro and SoundTransit. If you select, say, 12:25 pm as your departure time (5 minutes before the water taxi leaves) it puts you on the water taxi. However, as the water taxi is not very frequent, it will put you on a different assortment of routes if your departure time is set to be too far from a water taxi departure. Having the current delay for real-time planning is nice. But it would be nice if Google or someone else would use this data to create on-time percentages for each route & trip in advance. Many websites already do it with airline data. I can rely on google maps to tell me that a burien-greenwood car commute can take up to 60 minutes in evening rush hour traffic, or 30 minutes without traffic. Ask it to do the same for transit? It predicts an 80 minute commute no matter what the traffic conditions or time of day. Unacceptable. Google Maps (desktop and android) is currently telling me “Sorry, we could not calculate transit directions from” the udist to the main ballard business district, arriving at 11:25am tomorrow. One of the few times that kingcounty.gov trip planner is being more useful.